The sleeping hood design is greatly improved. It snaps on, rather than threading on with nylon webbing. Also, it’s contoured rather than flat, and should fit a snoozing baby’s head much better. There are two more inches of padding in the shoulder straps. This is a suggestion I (and others, I’m sure) had made to Beco to improve the fit for bigger people. I’m glad they listened! The infant insert is now removable. 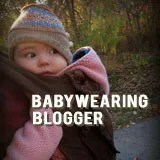 So if you’re wearing the Beco Baby Carrier with a bigger baby, you can just take out the infant insert and stash it somewhere safe. This isn’t really a functional issue, but the carrier is now made in the USA! Which is important to many consumers. I’ve got the Beco Butterfly 2 available in Metro Black, Trinity, Sara, and Avery (all on black body/straps) and Espresso Brown, River, Carnival, and Jacob (all on espresso brown straps). Oh and p.s. — if you’re looking for a toy carrier for your child or someone else’s, you’ve got to check out the Beco Mini — it’s adorable! 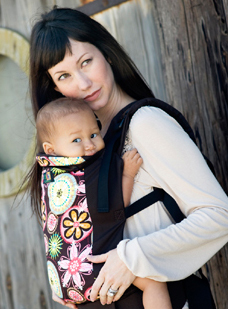 Due to popular demand, I’m opening for pre-orders on the May prints of Beco Butterfly Carriers, including Carnival, Allison, Natalie, and Isabella. I will also have more Metro Black in stock. I will have a limited number of these super-cool new prints of the super-popular Beco Butterfly — Aubrey, Chloe, Emma, and Ethan. So get yours while you can! New Beco Butterfly Pictures Are Up! The April prints of the Beco Butterfly will be in stock at the end of the month. Please email me if you want me to add you to my list for notification when I open for pre-orders. Many thanks to Katie for permission to link to her very helpful YouTube demos on using the Beco Butterfly! These are a great adjunct to the official DVD that comes with the Beco Butterfly. Endangered Beco Butterflys have been released into the wild! I have listed 2 Ethan, 2 Mia, 4 Ava, and 2 Sophia. These are the last of their kind! My shipment of Beco Butterfly Baby Carriers has arrived, and is available for immediate shipping (which is free in the US!). My retrofitted Butterflys from the January and February print runs are back, too, after a detour via Europe (!) courtesy of the U.S. Postal Service. I’m not quite sure why the mail guys mistook Princeton, NJ 08540 for FPO AE 09840. I will be listing the retrofit prints I will have in stock (a couple of Sophias and Avas, some Mias, and POSSIBLY a Carnival and Joshua) after I hear back from people who had expressed interest in these prints. If they don’t want them….I’m releasing them into the wild! My March prints of the Beco Butterfly will arrive April 11th and start shipping on April 12. I’ve opened up for pre-orders. I’ll have Olivia, Isabella, Metro Black, Espresso Brown, and a few Avas and Ethans in stock. Get yours while you can! 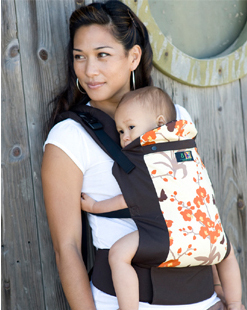 All Beco Butterfly carriers ship FREE in the US! International customers receive a $5 rebate on shipping costs.